Coco Beach Restaurant, St. James Club, Antigua. L-R: Arianne Deschênes, Correna Tymchen, Uniglobe; Bryan Bobroff, Flight Centre Independant: Amanda Drexler, Travel Agents in Action; Samantha Boucher, Maritime Travel; Anita Paton, Travel Agent Next Door; Marsha Moss, St. James Club, Corporate Administrator; Shannon Vidal, Sunny Days Ahead Travel. 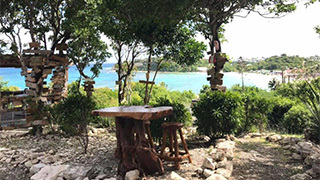 The Outhouse at Pineapple Beach Resort, Antigua. Rock Cottage at Blue Waters Resort & Spa. 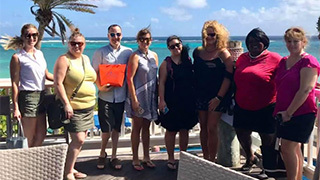 The six agents who logged the most bookings on the Antigua and Barbuda Tourism Office’s agent portal in 2018 were invited to visit the island for a luxurious reward FAM. And Open Jaw had the pleasure of coming along for the ride. The quick three-night trip, from 9-12DEC, was no ordinary FAM. From the fast-track welcome at V.C Bird international Airport to the friendly send off by the Director of the Executive Lounge a couple of days later, the agents received VIP treatment at all times. The group was housed in the magnificent villas of Blue Waters Resort & Spa, regularly frequented by prestigious guests, such as Robert De Niro and Prince Harry. Upon arrival, they were greeted with champagne. The surprises kept coming. That evening, they enjoyed a Ccaribbean barbeque at Shirley Heights, and danced to live music amongst Antigua Yacht Show goers. The FAM hostess was none other than Tameka Wharton, Canadian Sales and Marketing Manager for the Antigua and Barbuda Tourism Office. On the trip’s first day the group visited many hotels on the island. Wharton divided the group to cover more ground. The agents then shared photos and information. The list of hotels visited offered something to suit all tastes and budgets, in order to demonstrate Antigua’s easy accessibility. Day two was pure fun. Split into groups again, some headed to Stingray City to interact with giant rays in their natural habitat, while others raced speedboats at Reef Riders. In the afternoon, the group met up at Blue Water Resort’s Rock Cottage, where they shared a wonderful grilled prepared by their own chef. Participants then lounged the day away by Rock Cottage 2 pools, while taking in panoramic views of the turquoise ocean. At 6 pm, they met again for a wine tasting hosted by Food and Beverage Manager Jasper Kok. They were then transported to the Cove restaurant for a great meal accompanied by Graham Hawkins, Global Trade Relations Manager at Blue Waters Resort & Spa, Kevin Phillips, General Manager and of course Tameka Wharton, the trip’s wonderful hostess. But that’s not all -- on the final morning, the agents were all given massages at the Blue Water Spa, then took advantage of the water sports, beaches and pools. The Antiguan hosts ensured the special treatment for top-selling retailers was carried out till the last minute. Correna Tymchen, Travel counsellor at Uniglobe Carefree Travel, confided to Open Jaw that she learned of the contest while researching extra commission sources on the Antigua and Barbuda Tourism Office website. 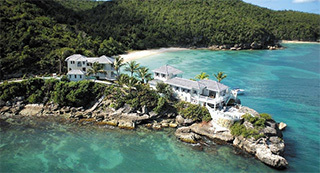 Tymchen is sending a group of 40 from Saskatchewan to Starfish Jolly Beach in February. That reservation ranked her in first place amongst sellers. Wharton has announced that this Reward FAM will take place again in December 2019. Starting in January, agents can log new sales in the online agent portal, all hotels combined.